Traditionally, local communities throughout Myanmar have extensively relied on plants for medicinal and health purposes. In today’s world, this traditional herbal approach to medicine still occupies a central role within many rural communities, given the clear lack of transport and health infrastructure in the region, as well as the remoteness of the villages. My fellowship research is documenting traditional medicinal plants knowledge in the Kune Lone area, located around Lashio District in Northern Shan State in order to highlight the extent to which locals rely on herbal medicinal plants. The area is a home to various ethnic groups, including Kokant, Wa, Shan, Larr Hu and Kachin. The research involves collecting, identifying and documenting local species and their uses. Through its study of these communities and their use of a variety of local plants and herbs, my fellowship research aims to document and spread this knowledge to others who could benefit from it, and also to demonstrate the important role that such plants play in local culture and economies. Interviews with local practitioners and villagers at Yaelei Kun. Four villages were selected for the research within a 79-mile radius around Lashio: Yaelei Kyun, Tone Kyat, Wa Soke, and Ohn Tone. The first two are located on the banks of the Thanlwin River in Kune Lone. Yaelei Kyun houses a total population of about 200 people of Shan ethnicity, made up of 36 households .In Tone Kyat, there are 170 householdsand total population of about 1288 people of Kokant and Shan ethnicity. Meanwhile, Wa Soke is about 9 miles away from the Thanlwin River mainstream, and located at the top of a mountain. Its population amounts to about 214 people, with a total of 41 households all of Kachin ethnicity. At the top of the same mountain, approximately 2 miles away from Wa Soke, is Ohn Tone village. Ohn Tone houses around 30 families, with a total population of 200 people of Shan, Larr Hu, and Kachin ethnicities. Villagers in Yaelei Kun village. Interviews with villagers in Wa Soke village. Villagers and medicine practitioners were interviewed in each of the villages through a series of questionnaires and surveys. 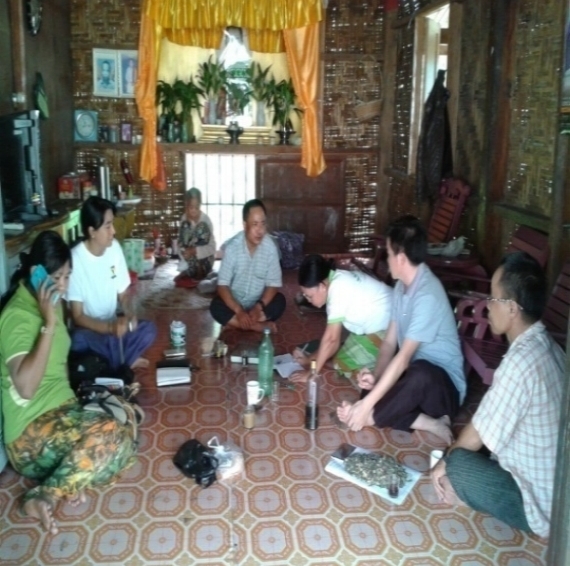 In addition, local people helped to collect traditional medicinal plants, to identify them, and record the data. Inhabitants of the selected villages use medicinal herbs and plants that grow in their surroundings to treat their health problems and diseases. However, local knowledge of these plants and their medicinal properties has never been properly documented, and is passed on through word-of-mouth only. This places it at risk of dying out and disappearing, and also that it is not recognized as important knowledge. Therefore, this study directly aims to address this situation by documenting this knowledge, with the aim of making it available to a broader audience of local communities who might benefit from it, and also demonstrating the importance and value of this knowledge to local communities along the Thanlwin River.